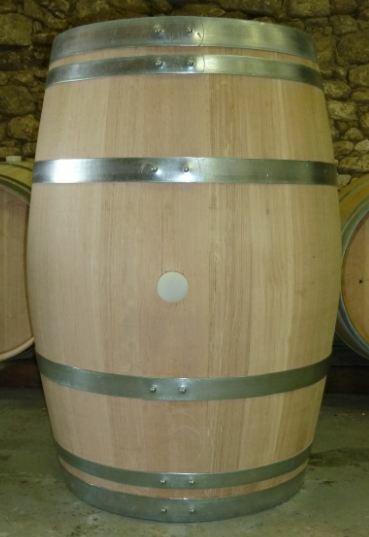 We make two red wines, a Prestige which is matured in french oak barrels for up to two years and a Classique which is matured in tank and then in bottle. 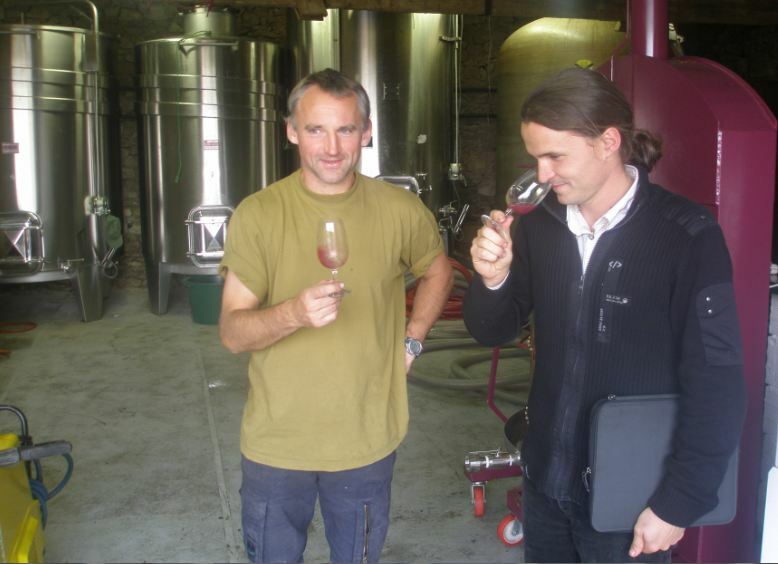 They are both AOC Sainte Foy Bordeaux. 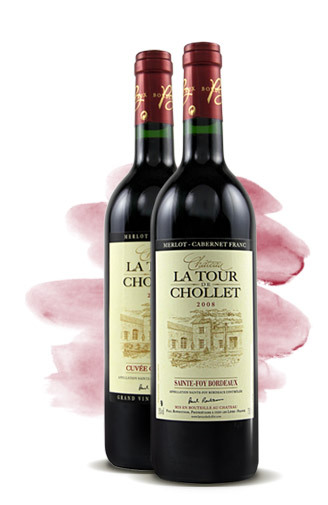 We have the 3 typical red varieties of the Bordeaux region, Merot, Cabernet Sauvignon and Cabernet Franc. 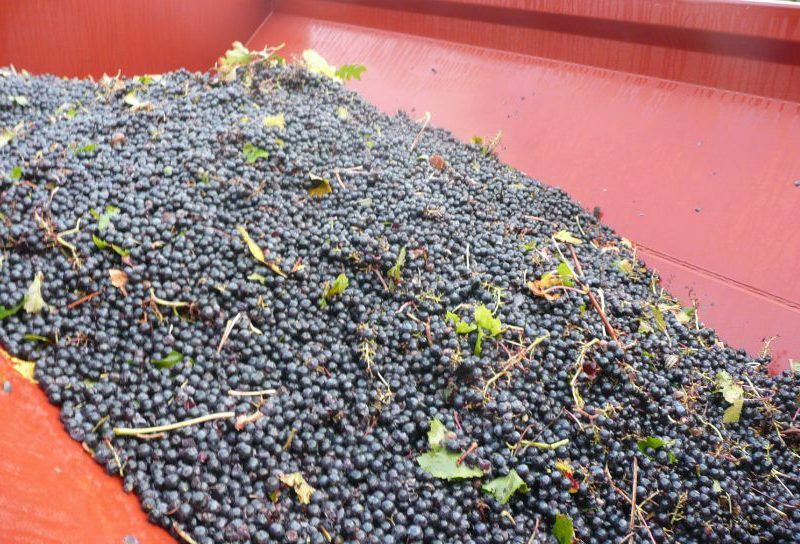 Read on to find out how red wines are actually made. Choosing the time to harvest is critical, too early and the grapes are too acidic and too late and they will start to rot, if it is raining then the wine is literally diluted. 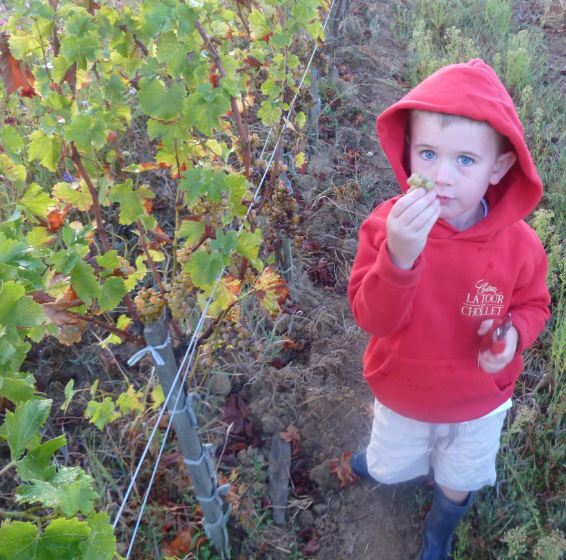 We pick most of our red grapes by machine, driven by our friend and neighbour Mr Christophe Chassaing. 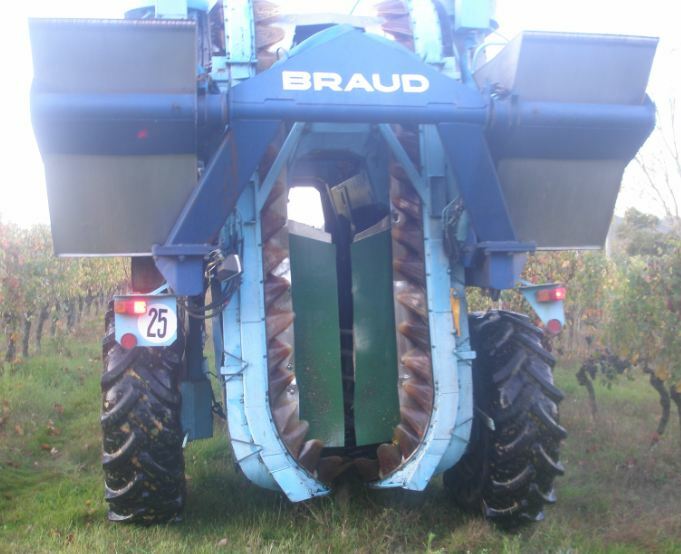 the machine straddles the row and then using rubber / plastic belts it vibrates the grapes off of the vine. 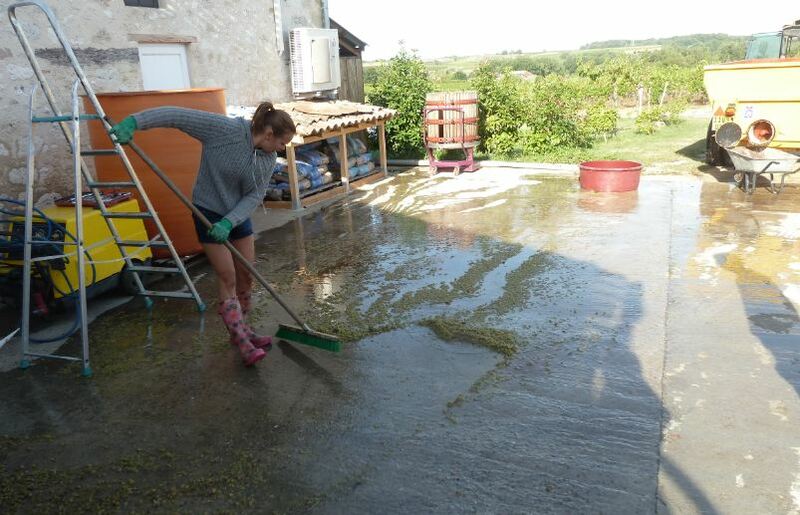 It is surprisingly delicately done and to ensure the quality of the grapes picked we always go ahead of the machine and remove anything we don’t want. 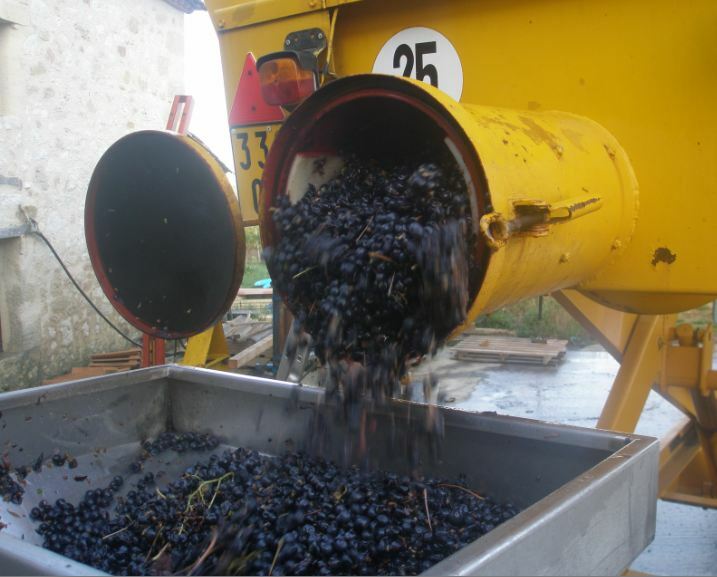 When the grapes arrive at the chai (winery) in the trailer they are pushed out of the trailer by a screw and then fall into the egrappoir, a de-stemmer / crusher which takes the stalks off and breaks the grape skins, they then fall into a pompe-a-marc (the grape pump) which pumps them through a big pipe into the cuve (fermentation tank).After a short period of time (6 to 12 hours usually), some juice is run off to form the base of the rose wine. This is put in a tank and fermented separately. 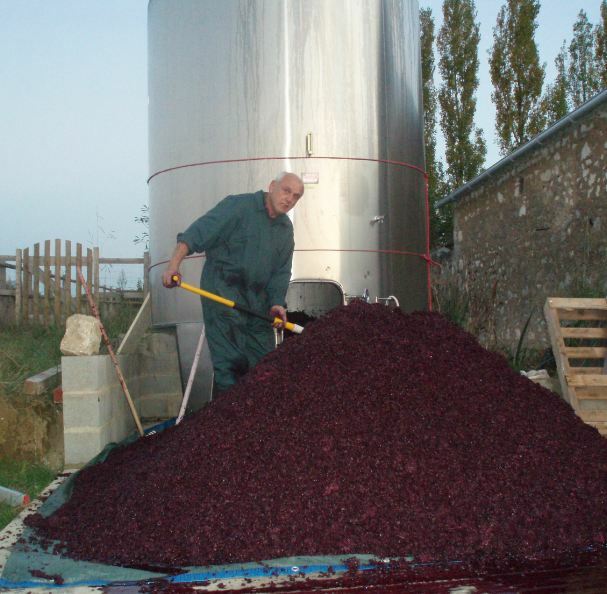 The remainder of the must (grape skins, pips and the rest of the juice) in the cuve begins the primary, or alcoholic, fermentation. 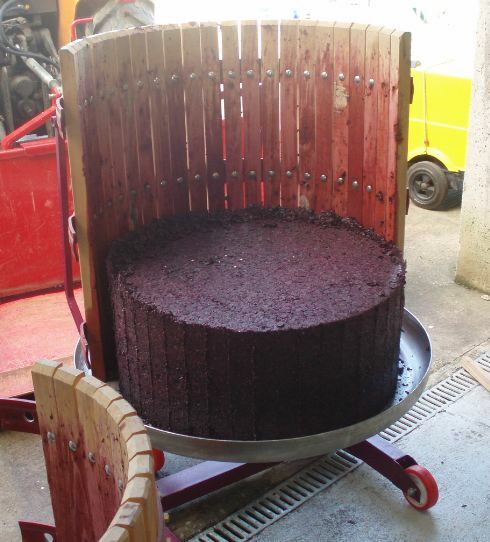 This usually takes about 10 days, and is finished when all the sugar in the grapes has turned to alcohol. 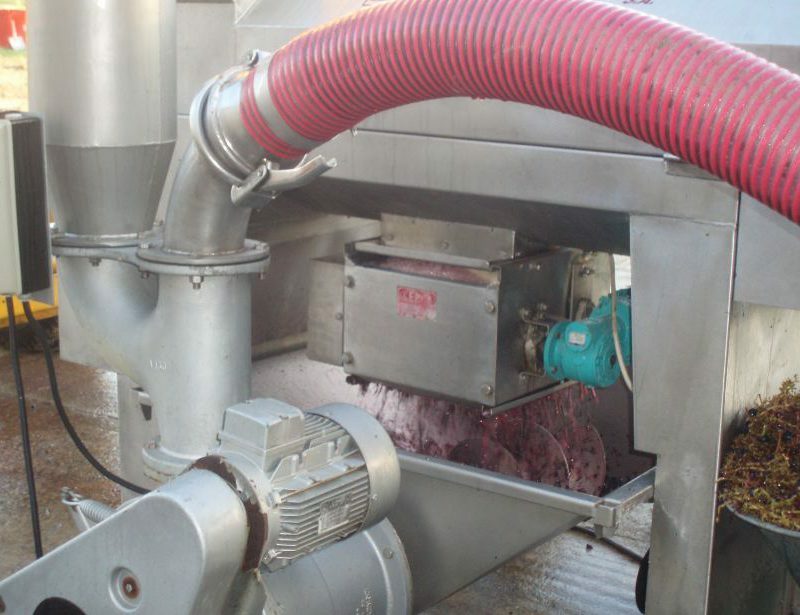 The juice is then run off the skins, and the remaining pomace (grape skin mush) is pumped out of the tank and pressed using a traditional basket press. 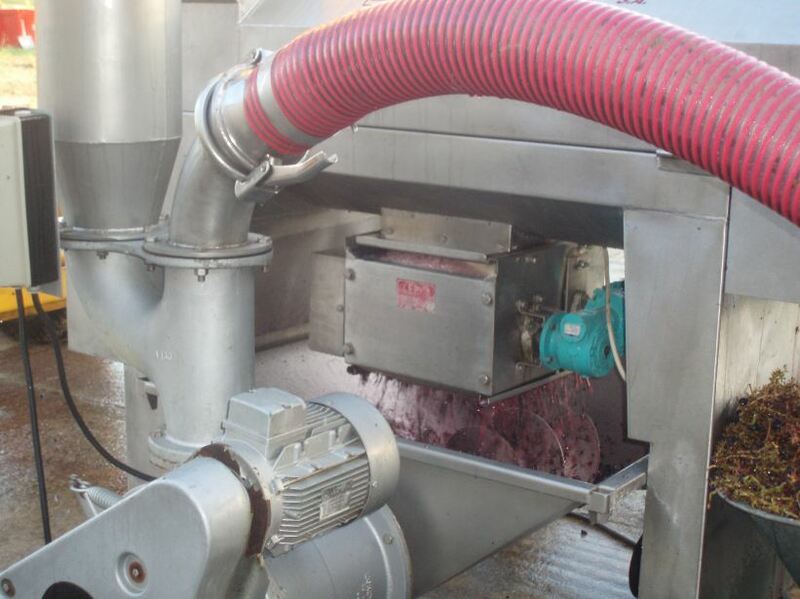 The juice extracted at this time is darker and more tannic than the juice previously run off, and is blended back in later on, if desired, to give the wine more body and structure. 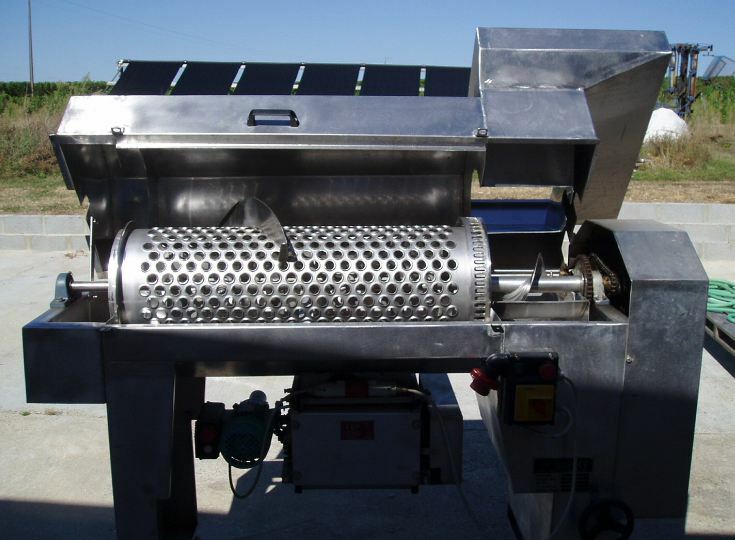 The remaining juice then undergoes the secondary, or malolactic, fermentation which changes harsh malic (appley) acid into softer lactic (milky) acid, for this process to be effective the juice needs to be at a constant temperature of 18 to 20 degrees. 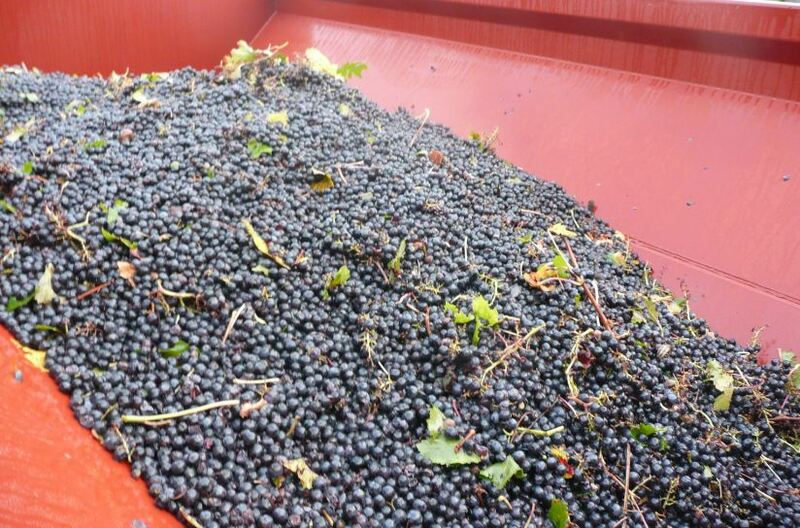 The above steps are repeated for each different red grape variety, as they are kept separate throughout the fermentations. Once the fermentations are complete then the exciting process of blending can commence. 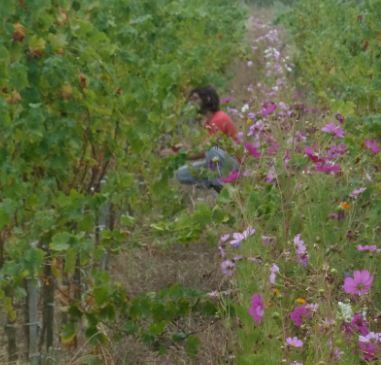 We, along with our oenologue, choose the desired blends for the classique and prestige wines. 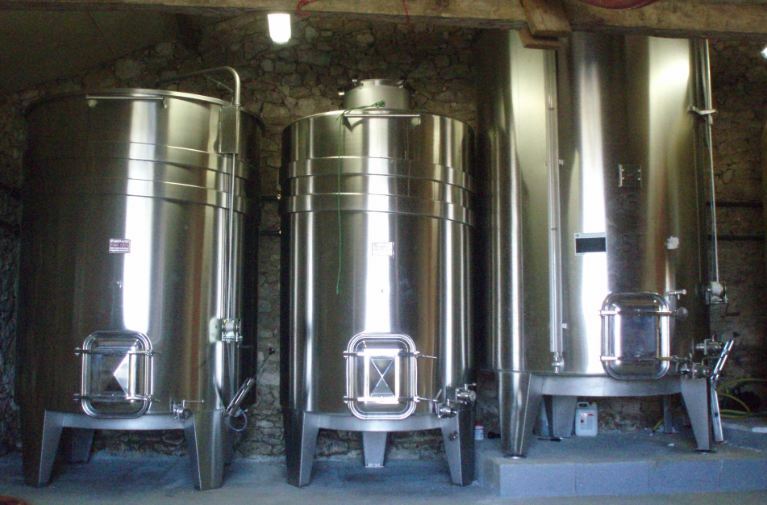 Once the wines have matured in barrel or tank, then can be fined and sometimes filtred and then bottled, the wines will then continue to mature in bottle until they are ready for drinking. 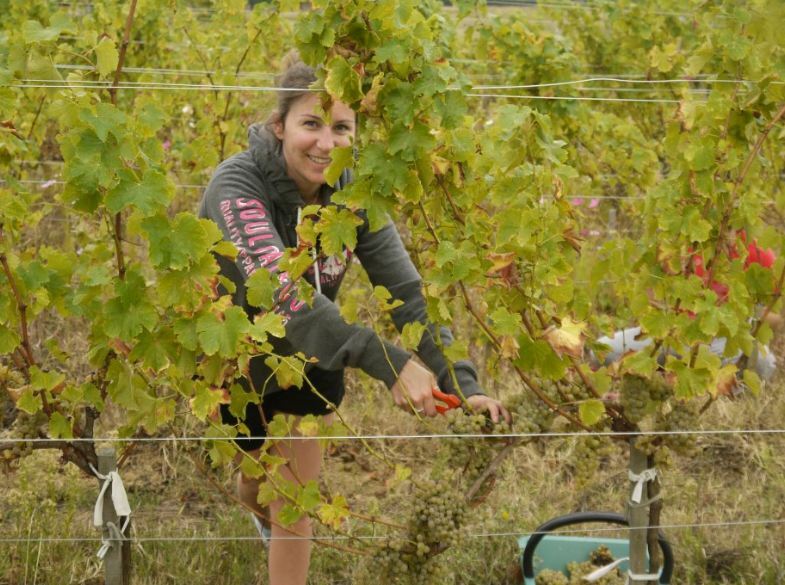 Join up to hear all the latest news and action from the vineyard and in the winery.